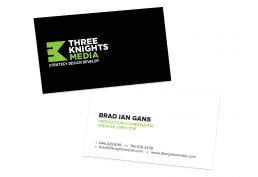 While working for Three Knights Media, a digital media, design, and production house in New York City, I worked on a variety of branding related materials and designs including the company’s own identity. The company wanted to revisit their logo and sought help in conceiving a simpler approach which would dramatically increase their visibility within the digital market. The result was a versatile and highly polished logo, one in which the graphical mark can stand alone apart from the word mark and also cleverly communicate the essence of the company name. 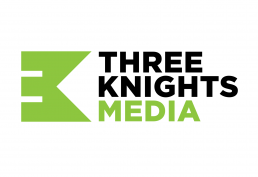 A series of brochures and one-sheets were created for Three Knights Media using existing promotional photography with emphasis on bringing the company’s new branding and digital portfolio to life. 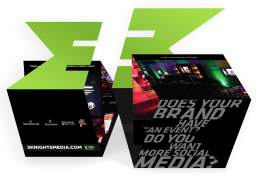 In addition to simple traditional one-sheet designs, a sophisticated, printed marketing piece featuring a square folding 5-panel layout was created.